The wonderful thing about having a laptop is that I can do my Sunday afternoon blogging while I do my Sunday afternoon cooking. I’m trying to get better at preparing meals on the weekend so that we can eat easily and healthfully during the week. Until October, I hadn’t worked a full-time job in two years. I knew I had it easy only working 3/4 time, getting off 2 hours earlier than everyone else, but it really hits home how much extra time that is when you don’t have those two hours free anymore–and you arrive home starving. Throw a few pregnancy-related food aversions and some morning sickness in there and you can see how we started eating sandwiches for breakfast, lunch, and dinner. Now, I have nothing against a good sandwich. I could list off three or four that I could eat for the rest of my life and be happy (even if my gut isn’t). Bread is the best delivery system for deliciousness I know. Cheese. Butter. Bacon. Turkey. Mayo. It’s all glorious on a sandwich, but I have this problem with bread. It just doesn’t like me. Even gluten free bread (which is all I’ve eaten for the past two years, when I’ve eaten it.) Gives me trouble if I eat more than two or three slices a week. I’ve always had trouble with yeast. I can’t digest it and I can’t fight it off, even with an arsenal of probiotics on my side (kombucha, sauerkraut, yogurt, pills) I can’t combat the indigestion it causes me unless I just plain don’t eat it. It’s helpful when I avoid sugar as well, but I’ve doing a pretty crap job of avoiding that lately. Thanks, Christams. But now that most of my pregnancy aversions are going away and the holiday season is just about over (just New Year’s and my birthday left!) I’m trying to rein in our food choices a little bit. Today I’m boiling eggs so we have a fresh supply of deviled eggs everyday. One of the few pregnancy aversions still with me is eggs cooked anyway but deviled–but I still want them for breakfast every morning, if that makes sense. A giant butternut squash has been chopped, seasoned, and roasted, and mini burgers have been prepared, both for lunches. One thing I keep seeing on pinterest are lunch bots, which are pretty much the coolest lunch box ever, but I’m not sure I can justify to myself spending $30 on one lunch box, even though I know it’s way more economical than sending a thousand ziplock bags in a paper sack. And when you’re not eating sandwiches for lunch, you tend to send a bunch of little things to make up for it. Perhaps for Christmas next year? And for your patience, a little glimpse at the knitting I’ve done this week. Brock’s sweater grew by a few inches. 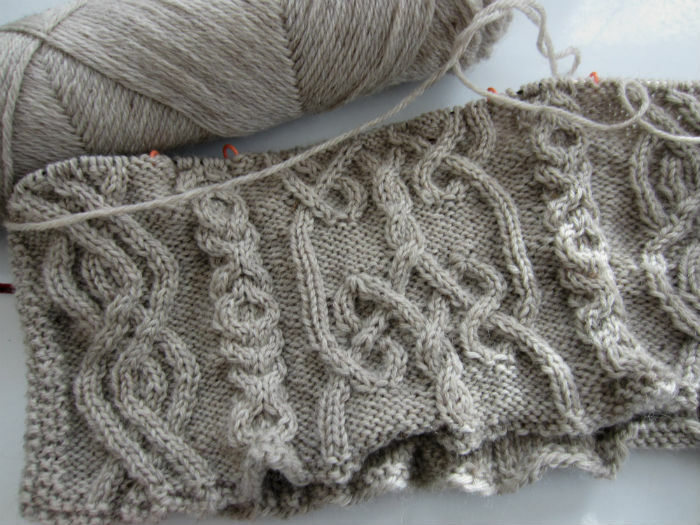 Now that I’m learning the cable motifs, I’m hoping it goes just the tiniest bit faster.